If you’re looking for snack fare for the Super Bowl, or warm, aromatic soft pretzels anytime, here are two recipes for your consideration. But first, here’s the history of pretzels. We love all good bread, and a soft, doughy pretzel (with mustard, please) is one of our favorites. If the pretzel is warm, it’s our idea of pretzel heaven. 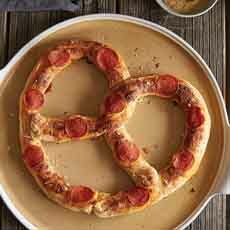 And for pepperoni lovers, pretzel heaven doesn’t get more welcoming than this recipe. It’s like a pepperoni pizza in pretzel form. Thanks to Pampered Chef for this recipe. If you don’t have a pizza stone, here are five alternatives. Here’s a video to help you with rolling the rope and twisting the pretzels (photo #3). 1. PREHEAT the oven to 425ºF (220ºC). Spray the pizza stone with oil. If you don’t have a spritzer, lightly brush with a pastry brush. 2. UNROLL the pizza dough onto a pastry mat. Roll the dough into a 17” x 12” (43 cm x 30 cm) rectangle. Cut the dough in half lengthwise. 3. SLICE the cheese sticks in half lengthwise to create 8 pieces. Grate the parmesan a fine grater. You should have at least 1 tablespoon (30 mL). Note: String cheese comes in several shapes and sizes; any one works. For the best results, no matter the string cheese size, line the slices up without overlapping, and make sure to trim any that hang over the edges of the dough. 4. LIGHTLY BRUSH the upper edge of each dough half with the egg white. 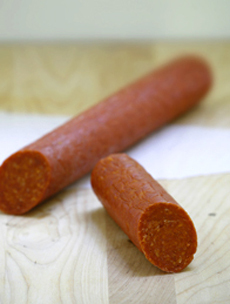 Arrange 8 slices pepperoni along the lower edge of each dough half, then top with cheese stick pieces. Trim any excess cheese that hangs over the dough. 5. TIGHTLY ROLL each dough half and filling to create a rope, pinching the edges firmly to seal. Slightly stretch the dough ropes. 6. MOVE the dough ropes to the center of the stone to begin making the pretzels. Form one long rope by pinching together one end of each small dough rope. Bring the free ends of the rope together to make an open circle. 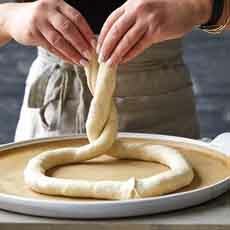 Twist the free ends of the dough one time, then bring the twisted end toward yourself and fold it down onto the base of the pretzel. SEE THE VIDEO. 7. Brush the pretzels with egg white (some egg white may be left over) and top with the remaining pepperoni slices and grated parmesan cheese. Bake for 14–18 minutes, or until the crust is golden brown. Serve with optional dipping sauce(s). 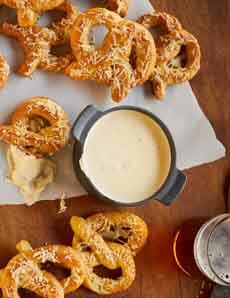 The dipping sauce for these pretzels (photo #3), from Wisconsin Cheese, is warm beer-cheese dip, similar to cheese fondue. This pepperoni pretzel, with mozzarella and marinara dipping sauce, is a brother to pepperoni pizza (photo courtesy Pampered Chef). The dipping sauce is parmesan and beer (photo courtesy Wisconsin Cheese). Pepper Jack for the Warm Beer-Cheese Dip that accompanies the Parmesan Pretzels (photo courtesy Eau Galle Cheese). Rolling the dough into a pretzel (photo courtesy Pampered Chef). 1. PREHEAT the oven to 425°F. Line two 15 x 10-inch baking pans with parchment paper. 2. UNROLL the pizza crust on a lightly floured surface. Cut the dough widthwise into 12 strips, each about 1-inch wide. Carefully stretch each strip into a 24-inch rope. 3. FORM each rope into a U shape. Overlap the ends, twisting once. Fold the ends down; press them tightly onto the bottom of U to secure the pretzel shape. 4. BRING the water and baking soda to boil in a Dutch oven over high heat, stirring occasionally. Drop the pretzels, two at a time, into the boiling water. Boil for 30 seconds, submerging the pretzels in the water. 6. COMBINE the parmesan and garlic powder in a small bowl. Sprinkle each pretzel with about 1 tablespoon of the parmesan mixture. Bake for 2-3 minutes longer or until the pretzels are golden brown. 7. MAKE the beer-cheese dip while the pretzels cool. Bring the beer just to a boil in a saucepan over medium heat. Reduce the heat to low; simmer for 2 minutes. 8. WHISK in the cream cheese and cayenne pepper until smooth. Gradually stir in the pepper jack until melted. Serve warm with pretzels. Makes 2 cups. *Monterey Jack is a semi-soft cheese. 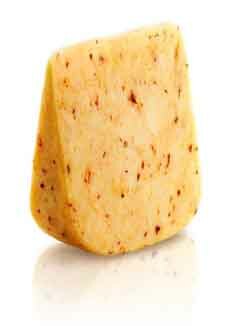 When young, it resembles muenster; when aged, it resembles cheddar. Pepper Jack cheese is Monterey Jack with red and/or green jalapeño peppers added.